Among the many hundreds who joined the Parihaka peace hikoi led by New Plymouth Mayor Andrew Judd, in June, were a group of students from Sacred Heart Girls College New Plymouth. Year 12 student, Jane Gray, reports. Sacred Heart College student Jane Gray (second from right) and colleagues joined the peace walk to Parihaka. The peace walk was a beautiful gathering of kind-hearted people who had all come together for a worthy cause. We saw no ill will, nor any disrespect, but only humble, tender-hearted people who wanted to help those who felt misjudged or underrated. When we arrived at the gathering we instantly felt welcomed and at peace with the situation we were in. When we were walking with everyone else, we felt like a part of one voice that was no longer calling out into an open void, but to intrigued ears that were willing to listen. 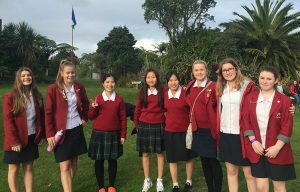 We as SHGC students, including the drama students, felt obliged to take part in this heart-warming event because we had recently been to Parihaka and had learnt about the events that had transpired there and in other places in New Zealand’s history. We had seen first-hand how families and friends of Parihaka are still being affected today. They don’t want pity, but help. They don’t want to look into the past and see all of the pain that they barely endured, but rather look into the future and hopefully see a brighter one. It is our obligation, as friends and neighbours of the people of Parihaka, to turn that ‘hopefully’ into a ‘definitely’.